I can’t remember where I first heard firesteels (Ferrocerium rods) described as ‘Dragon Sneezes’ but I always like the mental picture of baby dragons with colds surprising themselves with a sneeze of sparks. Firemaking with sparks is always popular with children at Forest School, but over the years, I have found that some children have difficulty holding and manipulating such fiddly little handles. They are also remarkably easy to lose amongst the leaf litter on the forest floor. No longer! I have pimped my firesteels with a touch of viking inspired dragon carving. The round one is my version of a 5th centruy ship’s figurehead in the British Museum. 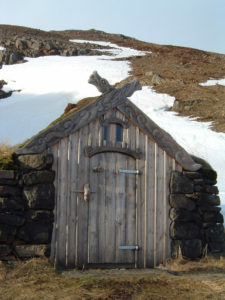 The more obvious Dragon is inspired by the picture above, taken in Laugar in Saelingsdal in the west of Iceland. 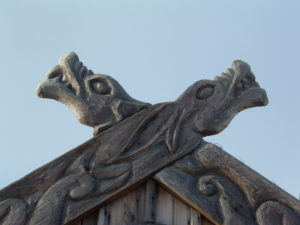 This area is the setting for the Laxadaela Saga and these carved dragons adorn the new changing room for Gudrun’s pool where the anti-heroine of the saga entertained her various suitors. 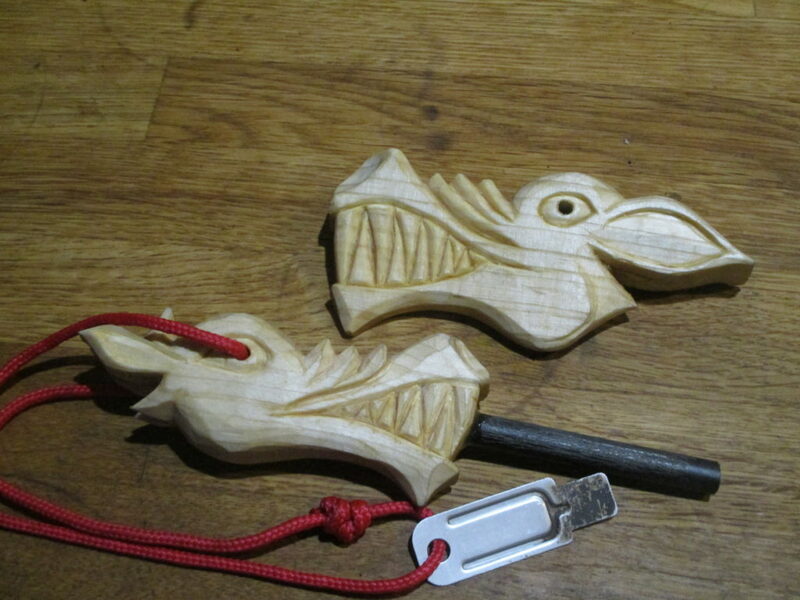 Icelandic Viking inspired dragon handles. All 3 handles were made from a Birch tree felled at Escot by students on the last Forest School Leader training course. 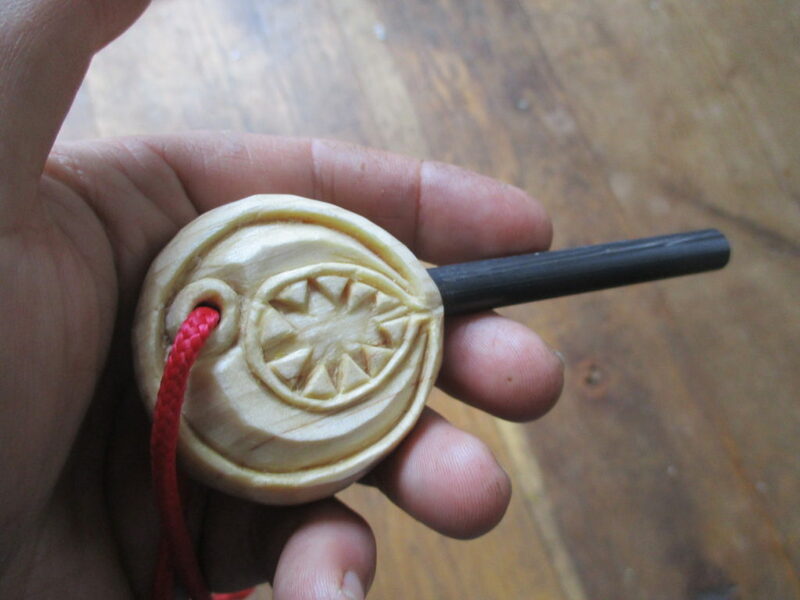 Roughed out with an axe and then whittled with a frosts mora 106 knife. The details are all carved whilst holding the blade of the knife like a pen with just the last centimetre protruding. It feels strange to start with and looks scary to the uninitiated but is very satisfying to see long chips of wood pop out from each incision. I’m still very much learning to do this sort of incised carving and these dragons are first efforts but my head is already full of other designs to try out. Now I’m off to watch another episode of Game of Thrones! Love these Richard, look forward to a course soon ? OK Claire, Adrian, Lets get something organised.